18 students and three faculty members from China expanded their classroom setting to include Assisted Living locations in Omaha. On August 1st and August 2nd, select Heritage Communities locations introduced students to the senior living/assisted living industry. The students were part of an exchange program, coming from two separate universities in China. The young men and women were studying in the areas of pharmacy, occupational therapy and/or physical therapy. As Chinese culture traditionally relies on family members to care for aging loved ones in their homes, assisted living and memory care options are limited in the students’ country. The purpose of these visits was to expose the students to a practice setting in the US that is very different from that of China. Visits to assisted living communities in the United States also offers an opportunity to understand a different setting for clinical rehabilitation practice. The Heritage at Sterling Ridge (127th & Pacific) and The Heritage at Legacy (168th & Center) served as assisted living host sites. Key members of each location’s leadership team spent time detailing services, amenities, clinical roles, pharmacy and therapy options available in assisted living. From there, students observed interactions. 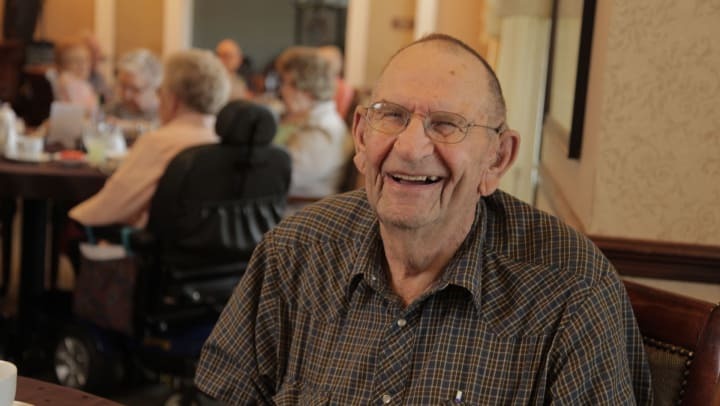 During the last portion of their visit, the students engaged in a community-wide life enrichment activity with residents sharing their experiences, lifestyles and traditions.